What you’re looking at is one of the towers of Lasalle College, a small private art school in central Singapore. 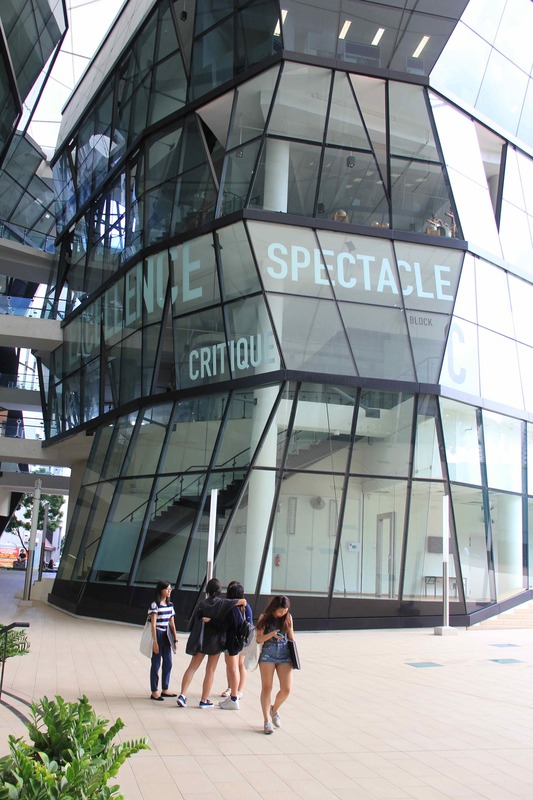 Built in 2007 to a design by RSP, it was extensively funded by the Singaporean government who have been enthusiastic promotors of all things ‘creative’ since the early 2000s. Of all the things I saw in Singapore last week, this was perhaps the most thought-provoking, less for the architecture (which is undeniably spectacular) than for the attitude that it embodies. It makes a simple deal: accept that the arts are in the service of the national project, and they will be funded with an inconceivable generosity. The deal is legible enough in the window vinyls, the words ‘excellence’, ‘spectacle’ and ‘critique’ screaming out the message. For many UK humanities academics, this kind of of sloganising is simply grotesque: aren’t these words supposed to be a means of interrogating the very things they seem here to support? You can picture a generation of cultural studies scholars with their heads in their hands. That reaction, to my mind, would miss the subtlety of the deal. Of course ‘spectacle’ and ‘critique’ and all those other words shouldn’t be turned into mere decoration. But I doubt those words are really much more than decoration in any of the work we might do in the west, the business of naming being, after all, a form of commodification (and where would critical theory be without all those publishers making a business from it?). Lasalle abruptly challenges that myth. To believe in the myth, you have to cling onto the comforting idea the arts can be somehow stand ‘outside’ society too, a zone of freedom beyond the reach of government. That freedom would be nice were it real, but my twitter feed during the period I was away suggested that my world was in fact a narrow and censorious one. Too often last week, my academic freedom seemed to be the freedom to agree with a majority view. Lasalle’s windows inadvertently say the unsayable: our freedom is conditional on complicity. It’s discomforting for westerners, but in Singapore’s case, for 50 years, the government has been adept at meeting its part of the deal, remarkably so. It houses and feeds its citizens better than any European country I can think of (certainly Scotland, whose record on both is scandalously awful). Of course, Singapore’s wheels may well be coming off, as two NUS academics, Donald Low and Sudhir Vadaketh, have argued in an excellent new book. But for the time being, Singapore remains a compelling, if troubling example. Things have been quiet lately on this site partly because I’ve been doing THE MUSUEM OF EVERYTHING. http://sites.ace.ed.ac.uk/museumofeverything/ The site’s first post is reproduced below. Check in daily for updates. The project ends officially on 21 February, but if there’s any demand, we’ll keep the web page going. THE MUSEUM OF EVERYTHING is an imaginary museum created by its visitors over a five day period from 17 to 21 February 2014. It takes place in a big, airy room in Minto House normally used for architecture studio crits. On entering, you’ll see a sign setting out INSTRUCTIONS FOR OPERATION. It’s really very simple. You take a 8″ by 5″ file card from a box and on it you write, or draw, or otherwise describe any object you would like to see in the Museum. Anything at all is allowed. It could be an art object – Picasso’s ‘Demoiselles d’Avignon’ (1907) for example, which we can temporarily borrow from the Museum of Modern Art in New York. It could be a scientific object, like an early microscope or the Large Hadron Collider. It could be an early Koran. Or the Titanic, raised from its watery grave. A live Giant Pacific Octopus. A set of chopsticks. It really is up to you. If the object is small enough, and you’re happy to let us have it, then stick it to the card. Once you’ve filled out the card, pin it to the wall along with the others, and then repeat the process as often as you like. The aim is to fill the Museum – generosity is positively encouraged. 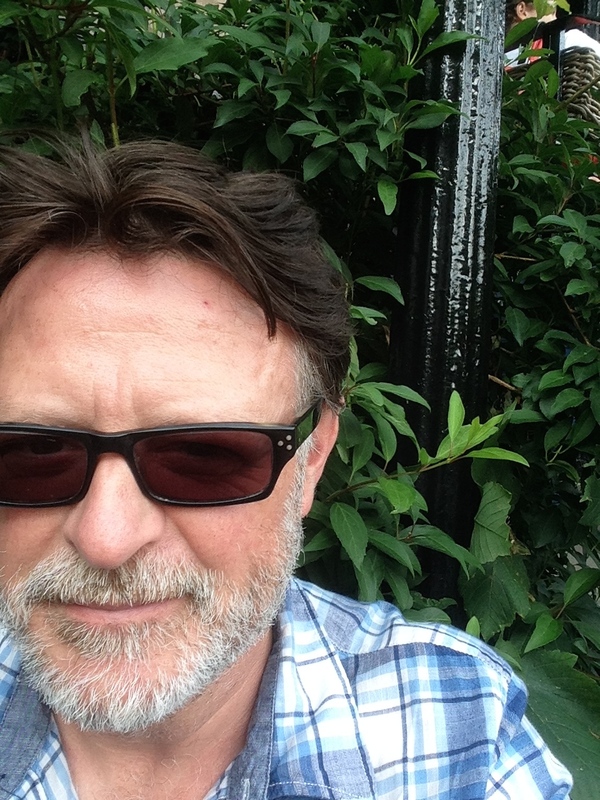 Maybe we can help create a new generation of cultural philanthropists, if only in our minds. At the end of the week, on Friday 21 February at 1300 there will be panel discussion involving Prof. Andrew Patrizio, Dr. Jill Burke, Dr. Carol Richardson and Dr. Frances Fowle of the School of History of Art at which we’ll discuss what kind of a collection we seem to have created, and what we should do with it. Robust – even iconoclastic – discussion will be encouraged. THE MUSEUM OF EVERYTHING has scope for a lot of fun. But it is also a serious exercise at a time when museums are so circumscribed by politics, the law, health and safety, the demands of lenders and the demands of insurance companies, the lunacy of the art market, and the competition for audience. With so many competing demands, it’s a wonder museums exist at all. What is certain is that we rarely have an open discussion about them and what we want from them, as we – in this case art historians – are also so often in the position of the Museum’s advocates. The Museum of Everything is, hopefully, a pause in normal business, and a chance to reflect. The Museum draws on a few historical precedents. The idea that anything might be included comes from the eighteenth century tradition of the Cabinet of Curiosities, an idea that increasingly appears in academic discourse in a cloud of something like nostalgia. The Cabinet’s fundamentally anti-rational character is the very opposite of the present day museum – it has something we’ve undoubtedly lost. The Museum of Everything also draws in a wonderful and eccentric book by Andre Malraux, the Museum Without Walls, published 1952-4. 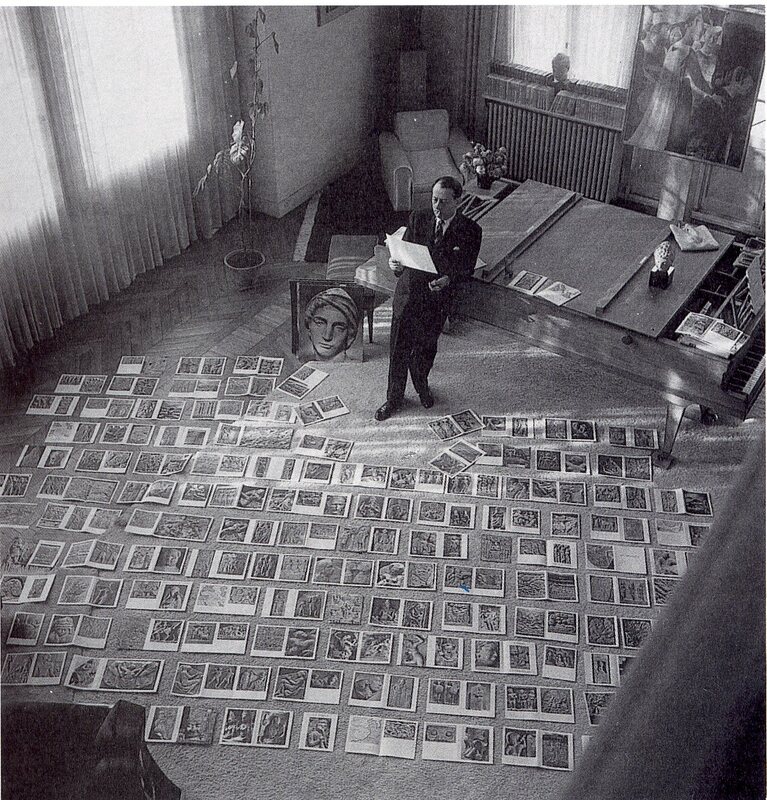 In a classic image from that book, Malraux is pictured looking a carpet of photographs of sculpture – the medium of photography, he argues, gives us the possibility of experiencing art in all kinds of new ways and in new combinations. No longer are we bound to a fixed architectural container. Malraux’s argument of course prefigured the invention of the world wide web, which has informed contemporary museum practice in ways we are only slowly starting to understand. Cognisance of that has to be part of our building a Museum of Everything, too. Finally, there have been one or two Museums of Everything in the past, including a London-based art project with the odd iteration on the South Bank. This is unrelated, not least because it’s an audience, not artist-led project. But we like the name, so we’re sticking with it. If anyone objects, let us know. So – you’re all welcome to the Museum, very welcome indeed. Visit anytime 0930-1700 and add as much as you like. And please, if you can, come to the events during the week, and help us decide what to do with our creation. I recently spent a morning at Google headquarters (‘the Googleplex’) in Mountain View, Califonia, at the northern end of Silicon Valley. It was a Sunday, so eerily quiet. I had half a dozen leads from Edinburgh, itself a minor tech pole, and I’d written to all of them requesting a visit. As it turned out, so ineffable is the company, and its campus, I might as well have been requesting an audience with God. So I just went alone and unannounced. The place was certainly a physical reality. As Wired journalist Andrew Blum points out in an entertaining new book, the internet is a material thing as much as an idea. Internet companies love you to believe in their insubstantiality, in their cloud-ness – but all that data has to be stored somewhere, and the work of managing it likewise. It was an easy enough trip from SF. I got into my rented Prius and whirred down route 101 to the Rengstorff exit, crossed the highway, and there I was. The campus wasn’t strictly a campus per se, but a constellation of campuses, each anchored by one or more Google buildings. Bordered by route 101, it has an artificial lake for boating, miles of hiking trails, and a huge amphitheatre like the Hollywood Bowl. In the distance to the south, across drained swampland punctuated with electricity pylons I could see NASA’s Ames facility. Defined by three of the world’s biggest buildings, arched sheds made for building airships during the Second World War, it’s one of California’s great architectural sights. The Google campus it must be said, isn’t. It’s a sprawling complex, at a guess 300,000 square feet shaped like a C-clamp, comprising half a dozen interlinked pavilions. Clive Wilkinson architects designed it; based in Culver City, one of the centres of the LA film industry, they specialise in ‘Building Creative Communities’. It’s not a statement building of the kind that Facebook are currently contriving with Frank Gehry. You could drive past it and notice (I did, at first). But in the open plaza that defines centre of the complex, there are some deconstructivist Gehry-like elements, as if the façade of an ordinary office pavilion had been taken apart and shaken about. There’s a great curved beam, arching into the sky, emblazoned with the Google logo, like a piece of model railway track. For the most part, it’s unspectacular, however and your eyes are drawn to the details. An organic garden occupies a northern corner of the plaza (a sign offers advice about seasonal planting, and a recipes – Organic Shephard’s (sic) Pie). A notice in the pavilion next door advertises the Google Film Club, whose carefully balanced, global programme looked the work of a genuine connoisseur. Of the details, though, it’s the G-Bikes that are most striking. Old-fashioned, sit-up-and-beg clunkers, they’re fitted with baskets and bells, and painted the corporate red, yellow, green and blue. There’s a useless rim brake, as well as a Dutch-style crank, so if you backpedal, you slow down. I don’t know why the two brakes. Safety first, I suppose. Anyway, they’re everywhere – hundreds of them, free to use for anyone who cares to. The abundance is really quite charming. I took one for a while. It felt like stealing at first, and the first few minutes felt deliciously transgressive (I had visited Apple the same day, and within seconds a security guard pulled up and yelled at me). But after a while, it was clear this seeming transgression wasn’t anything of the sort, but Google’s way of performing its generosity. 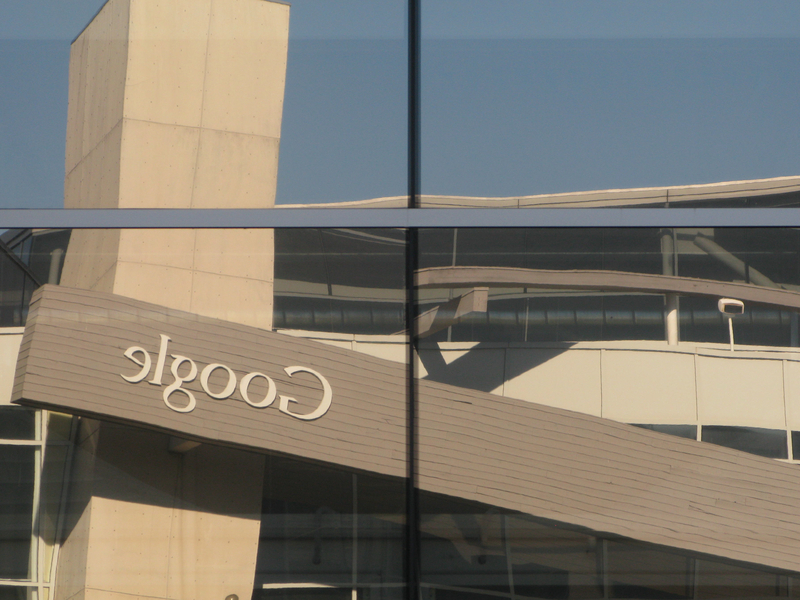 These days Google may be ‘evil’, but it still has a lot invested in seeming not. 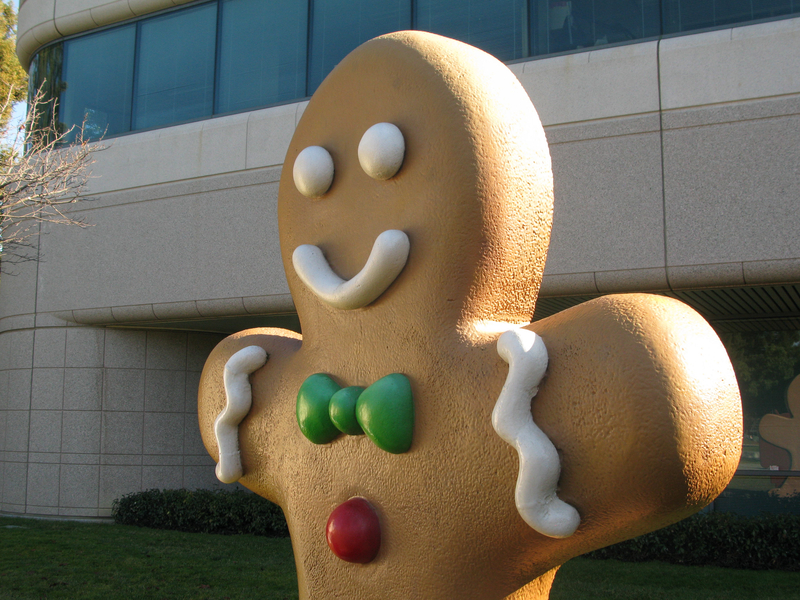 I soon grew tired of the Googleplex and pedalled over to an adjoining campus where a giant cupcake guarded the entrance. A handful of like-minded tourists milled around here, taking pictures – it was obviously what you did. They’d arrived on G-Bikes too, and like me were enjoying the perverse pleasures of the campus, before heading on to Facebook, Linked-In, and Yahoo! It was clearly the beginnings of a tourist trail, like Rome would have been for the eighteenth-century Englishman. 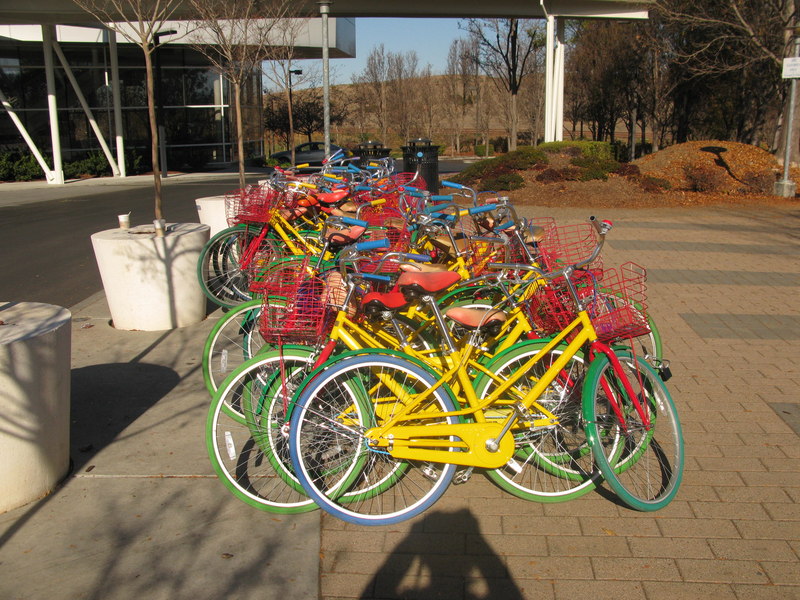 Google seemed to have cottoned on already, hence the bikes. So, go while you still can. Google is waiting for you. PS: Google – if you’re reading this, I put the bike back where it came from.